Ah, there she is! It’s nice to see Dark Magician Girl crack the Top 5. And she’s selling for over $1,000! Dark Magician Girl was a Secret Rare in 2003’s Magician’s Force expansion. According to the Pop Report, there are currently one 25 PSA 10, 1st Edition DMG’s in existence. That’s pretty darn rare. 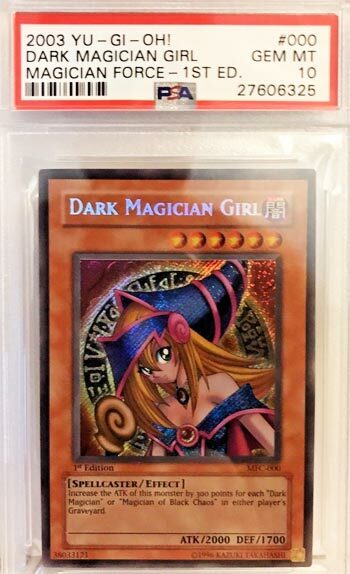 There are many waiting to be graded I’m sure, but I still think this Dark Magician Girl is still a good investment. She’s one of the most iconic characters, a face of Yugioh, and it’s her very first English card.